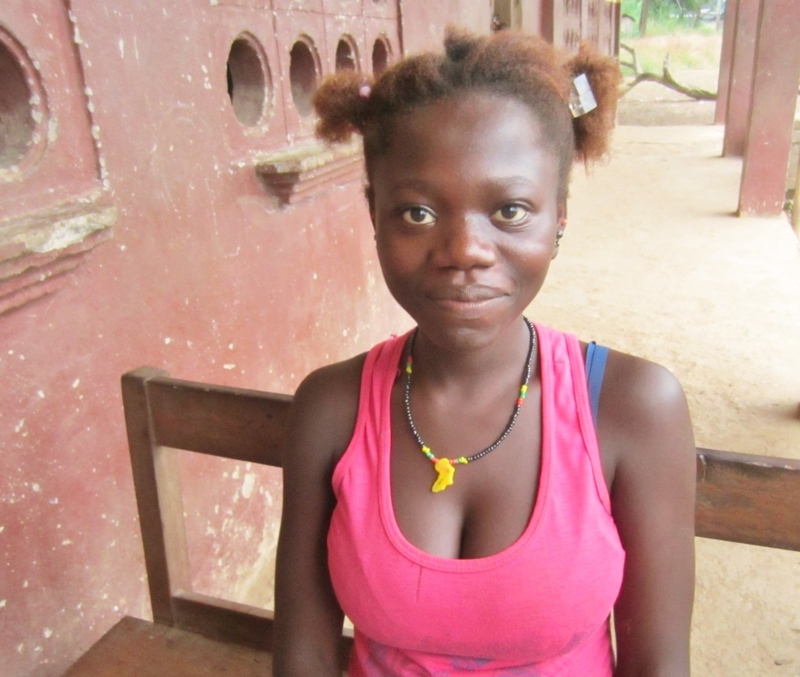 I thought I would be writing now to ask your support for Sherbro Foundation Sierra Leone’s girls scholarship fund. 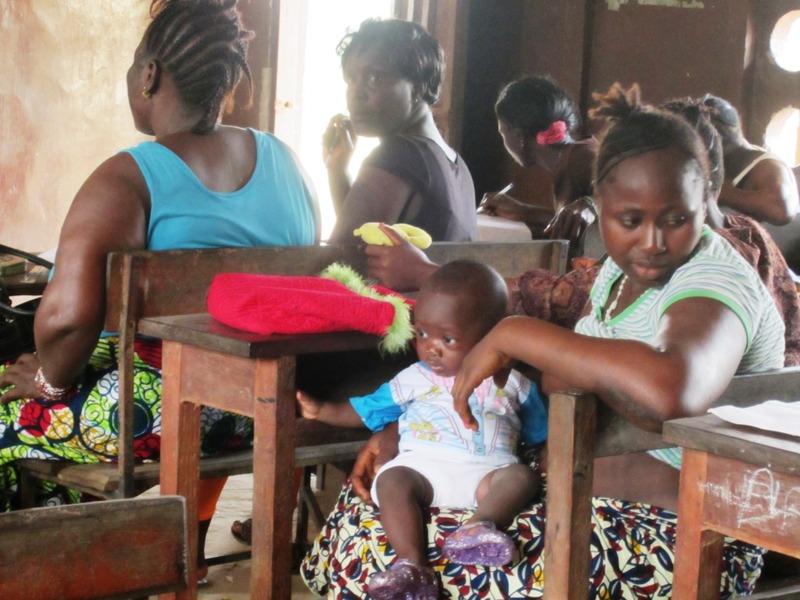 With the Ebola outbreak in Sierra Leone, school is indefinitely suspended. 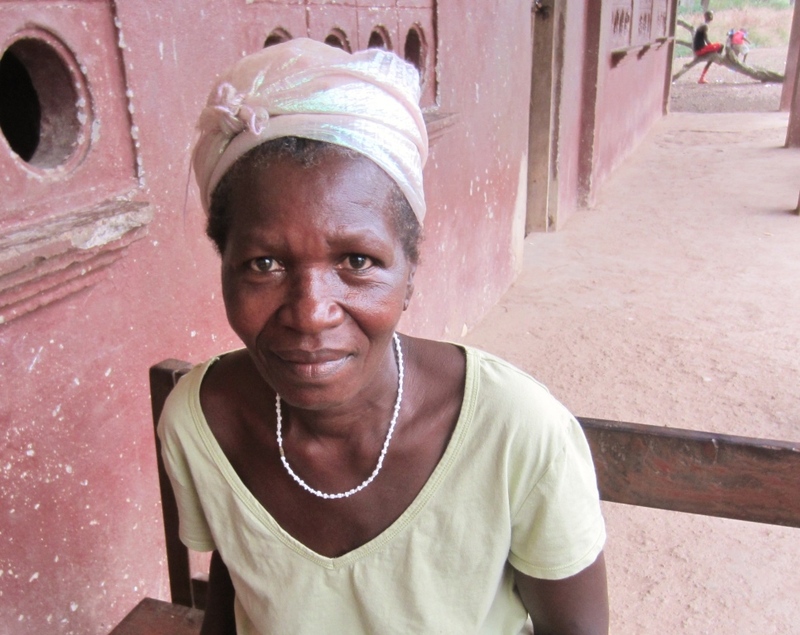 Instead, I’m asking for your help on getting Ebola prevention supplies to the rural Sierra Leone area we work with. CCET Executive Dir. 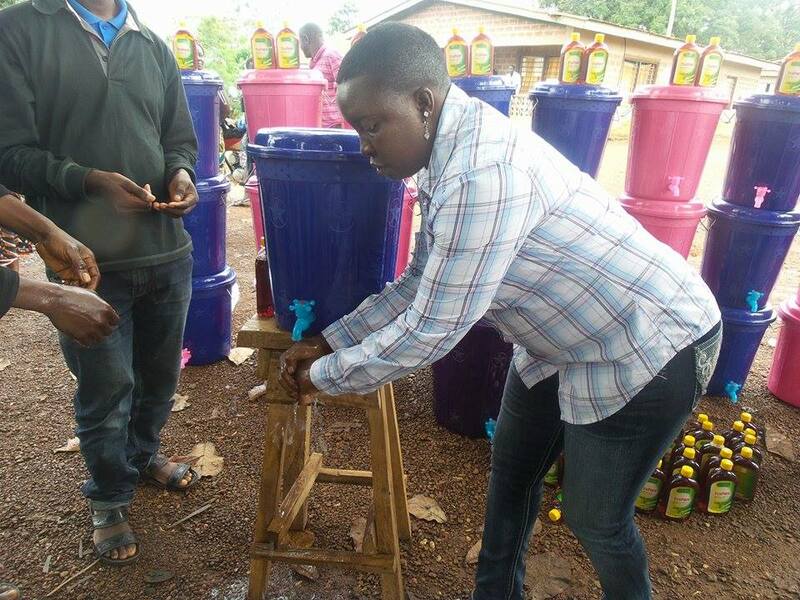 Rosaline Kaimbay demonstrates portable hand washing station filled with disinfectant solution. In the last two weeks, SFSL has had to shift our focus from education to helping Rotifunk and surrounding villages fight the Ebola epidemic. 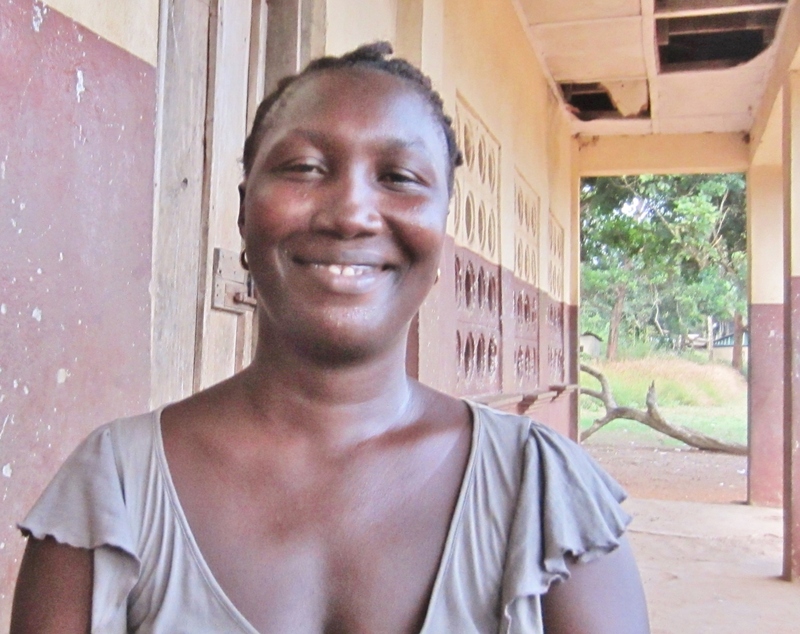 A second and bigger wave of Ebola is now moving through Sierra Leone. Neither the Sierra Leone government nor any NGO’s have reached rural areas beyond the outbreak epicenter with Ebola prevention supplies. Yet, it’s in these kinds of rural places the Ebola outbreak started. 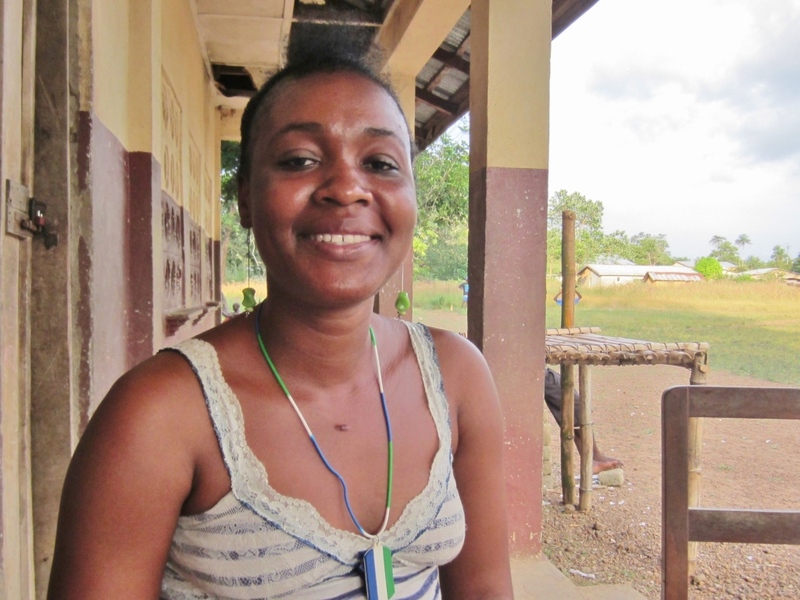 The majority of Ebola cases continue to be in two areas in eastern Sierra Leone. A national state of emergency was declared last week, and these two areas have been blockaded. Everyone is effectively quarantined in place for 21 days, the Ebola incubation period. Only food, water and essential supplies are allowed in. This is a necessary public health step to control the Ebola outbreak. But the disease had already started spreading around the country. People who became sick in the hot spot areas feared they would get Ebola if they went to a hospital. Before the blockades went up, sick people ran to the care of relatives in other districts. Some of these sick people had Ebola and transferred it to other parts of the country, including Moyamba district where Rotifunk is. This district now has four confirmed cases and fifty being tested. This is how epidemics spread. A frontline Scots aid worker describes the many direct and indirect effects the epidemic is having on an already fragile country. CCET, our local partner, prepares to deliver hand sanitizing stations. There’s a misconception that the Ebola outbreak is being managed for the whole country by large nonprofit organizations like Doctors WIthout Borders (MSF). MSF is heroically fighting the battle to save people’s lives already ill with Ebola in the two epicenters, and tracing their contacts for quarantine there. But they are not involved in prevention activities to stop the spread of Ebola in the rest of country. 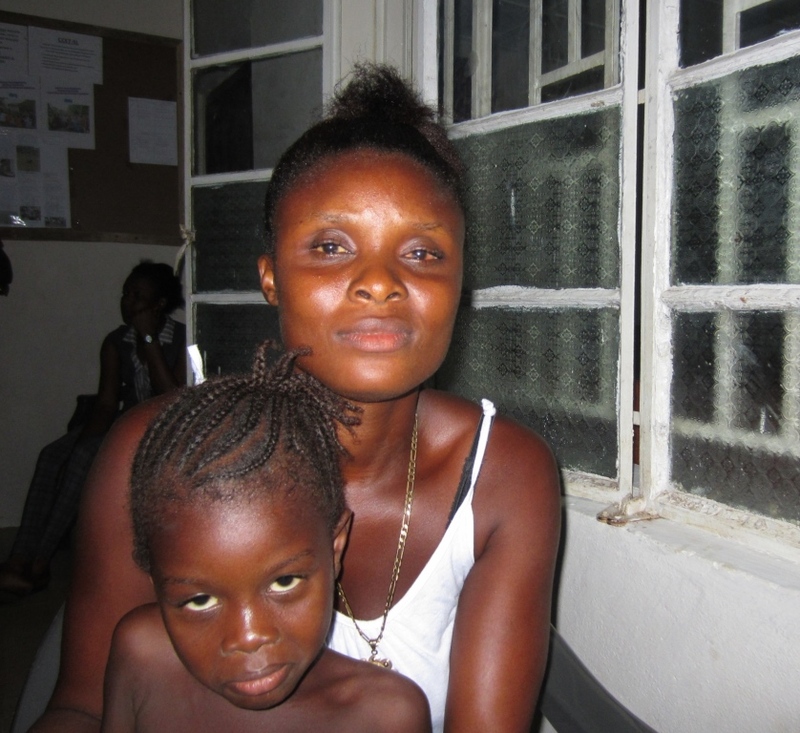 The Sierra Leone Government’s actions have been limited to reactive steps and mainly within their fragile health care system; not preventive steps across the country. 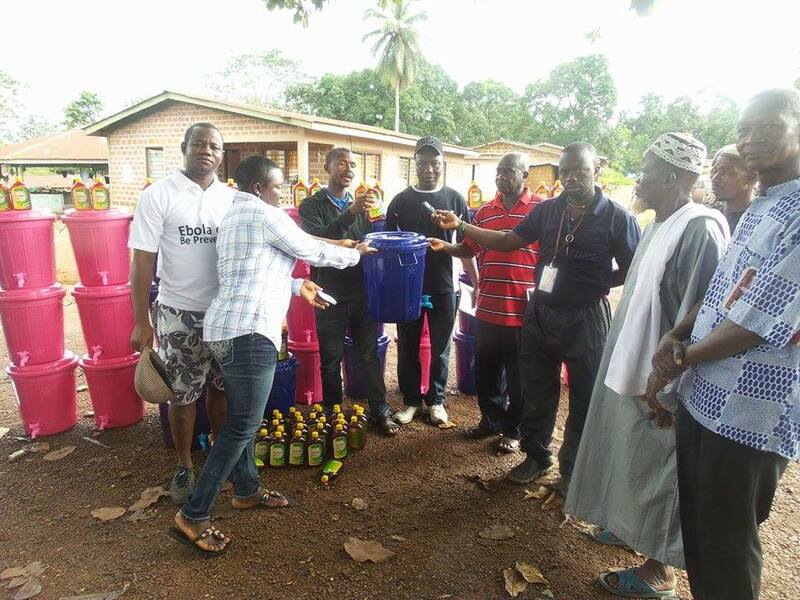 Sherbro Foundation is equipping Rotifunk and surrounding villages with portable hand sanitizing stations. This deadly disease can surprisingly be killed with soap and water and hand sanitizers. People are being trained to frequently wash their hands, especially when in public places like markets, churches, mosques and health clinics. 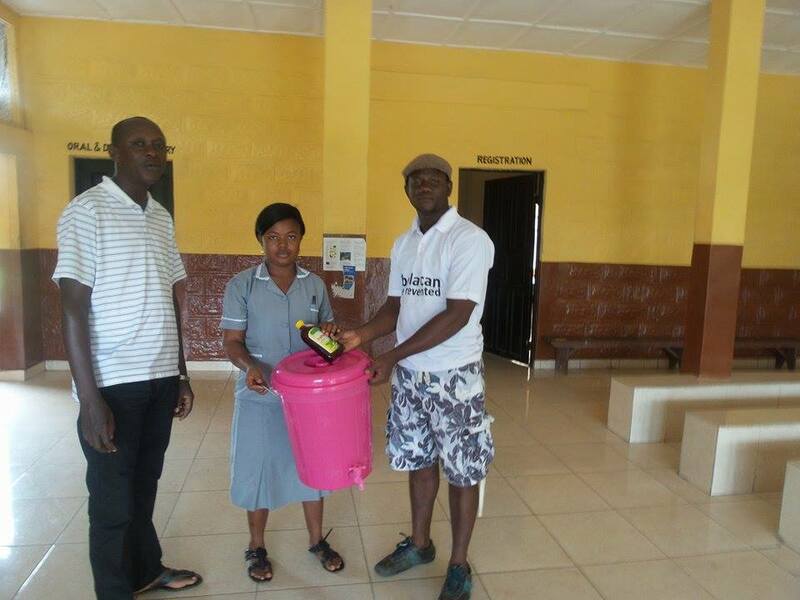 Hand washing station delivered to health clinic waiting area. Rotifunk, like most of the country, has no running water. There is nowhere to wash hands. Preventive steps like hand sanitizing stations in public places are not set up in rural towns and villages outside the two Ebola hot spots. SFSL sent money last week to set up over forty hand sanitizing stations like this one and a supply of disinfectant. Our Rotifunk local partner, the Center for Community Empowerment & Transformation (CCET)informed us today they need to reach more villages and have more disinfectant to go around. Prices on buying these portable sanitizing stations have gone up 50% in the last week, as goods are in short supply. CCET Executive Director, Rosaline Kaimbay informed me today they are being seen as unique in Sierra Leone with this kind of grass roots community-led effort on Ebola prevention. While towns across Sierra Leone are still waiting for Government and NGO assistance, they are taking charge on the fight against Ebola. It’s understandable that limited resources are first going to the epicenters of the emergency. 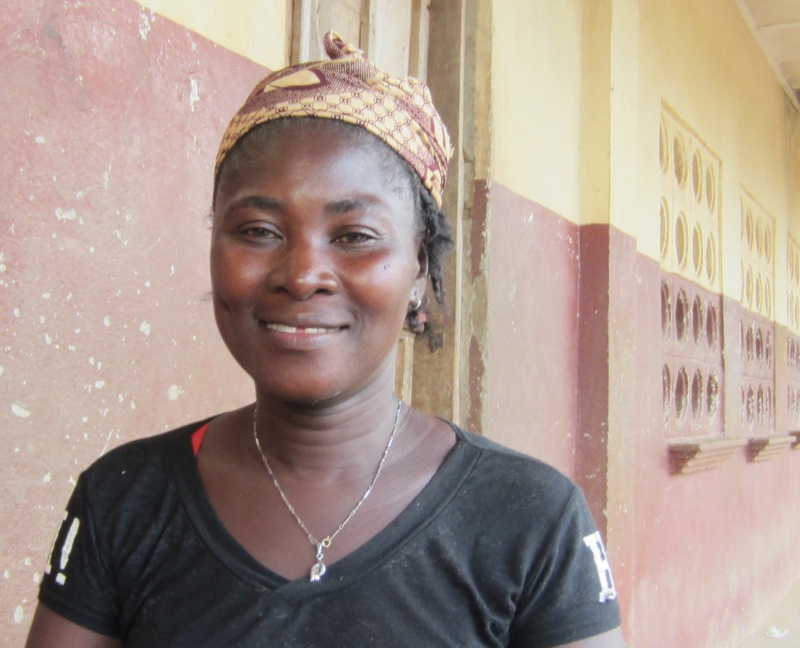 But unless towns in the rest of Sierra Leone like Rotifunk are equipped for preventive actions to fight Ebola, the epidemic can continue to spread across the country – and beyond. More lives will be lost. Time is of the essence. Can you help stop this tragic epidemic for the cost of a dinner out or one concert ticket? To donate online, just click here: Donate We accept all major world currencies. To send checks, contact us at sherbrofoundation@gmail.com. You can help even more by passing this on to a friend. Joining the rest of the world – this is how two of Rotifunk’s first computer literacy students described the way they feel about starting computer lessons. They know the world is computerized, and they have, to date been left out of the opportunities and the knowledge afforded by computers. Computer class at CCET office. Computer literacy and regular access to using a computer are among the most coveted resources in today’s Sierra Leone. People know this is their link to gain valuable job skills, better manage their work, and communicate with the rest of the world. The Center for Community Empowerment and Transformation received 50 laptop computers in August from American donors Schneider Electric and TIP Capital. They lost no time in building tables and benches with local lumber and creating a practical manual for students who have never used a computer. Lesson One started in Sept – October with how to turn it on and find the Word software. The first students are community teachers and other adults with a need to use a computer. They will form the core group to serve as trainers for high school students and others in the community. Only three or four of the 30+ secondary school teachers in area had any computer proficiency. Some had been exposed in college to manuals with screen shots of computer monitors as introduction, but never had access to using one themselves. Here’s a profile of some of Rotifunk’s first computer students. Samuel Caulker at his computer lesson. Deputy Paramount Chief – Samuel Caulker stands in as the ranking chiefdom authority for his brother, the Paramount Chief when both the Chief and his Chiefdom Speaker are out of town. Samuel says the world has gone computerized, but until now, Rotifunk was not part of this. This is his first opportunity for computer lessons and he wanted to take advantage of it. 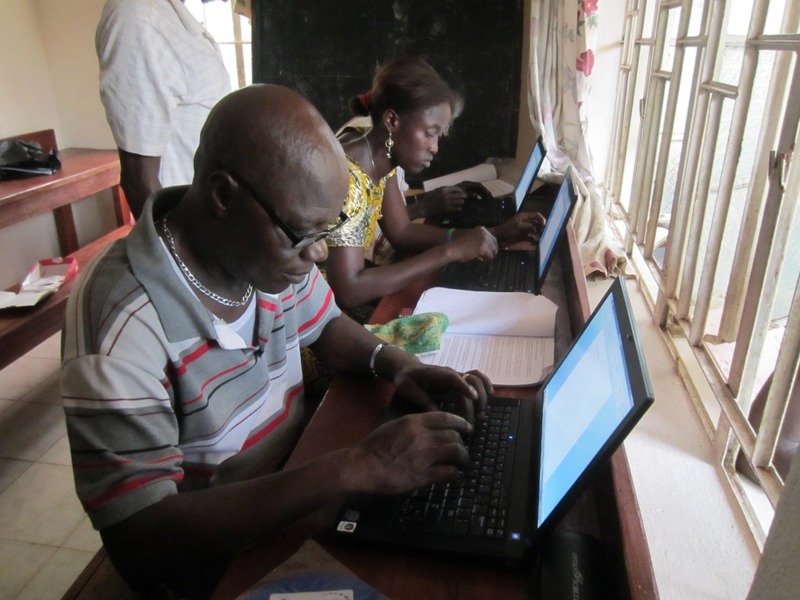 He was embarrassed when going to training workshops outside the chiefdom, and he had to say he did not know how to use a computer. Soon he can see computers in the Chiefdom Administrative Office. Records can be kept and accessed when needed on computers, like amount of taxes collected for the year and who paid in each Section. 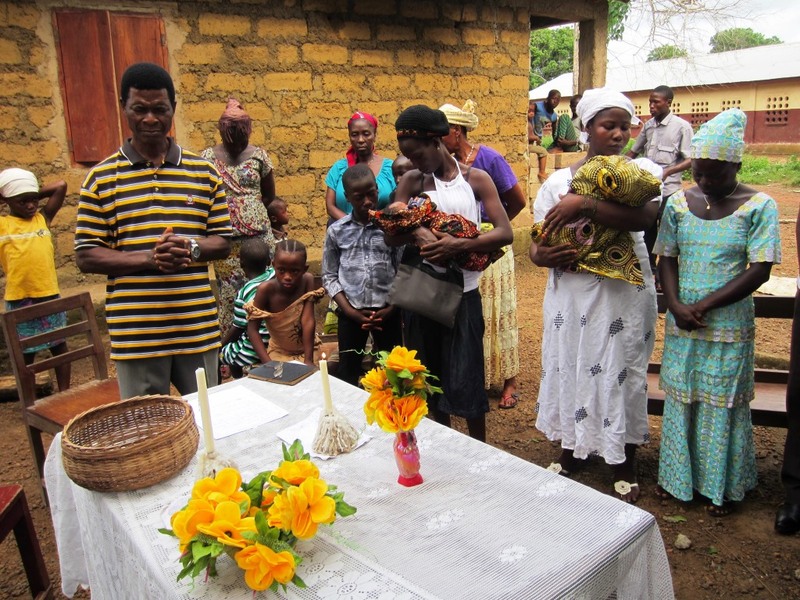 They can maintain land transfer records and avoid land disputes; they can keep names of all 208 villages in the chiefdom and the responsible headmen. Importantly, they can maintain minutes of Chiefdom Council meetings and other key chiefdom events. Samuel is not finding using a PC as difficult as he may have thought. They have excellent tutors from CCET committed to teaching them. It would go faster if they had more time to practice. They come at 5:00pm at the end of their work day. Lack of electricity and cost of running a generator limit the time of the class to 6:30pm when it’s too dark to see. Today they had to stop when the battery on the computer ran down. Samuel wants to thank Schneider Electric and TIP Capital for the opportunity to learn to use a computer and will make good use of his class. He also appreciates the low cost of CCET classes. 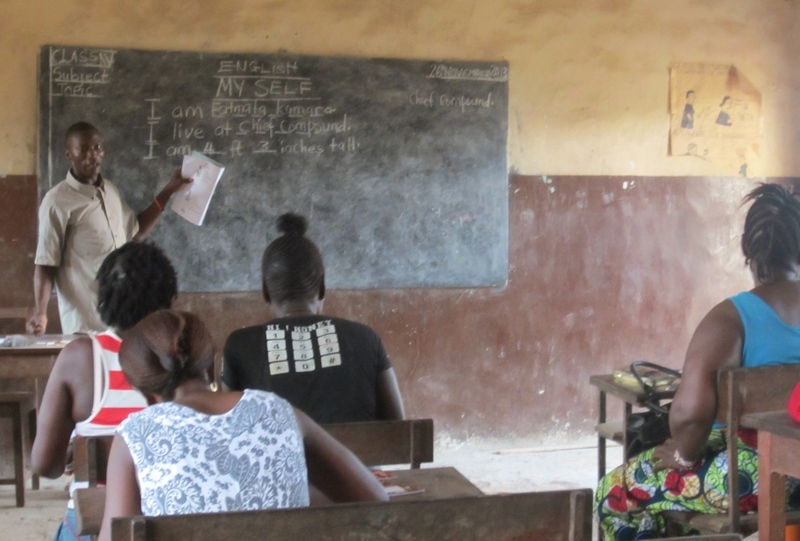 They are paying Le30,000 (~$7.50 USD) for classes that would cost Le150,000 in Freetown. 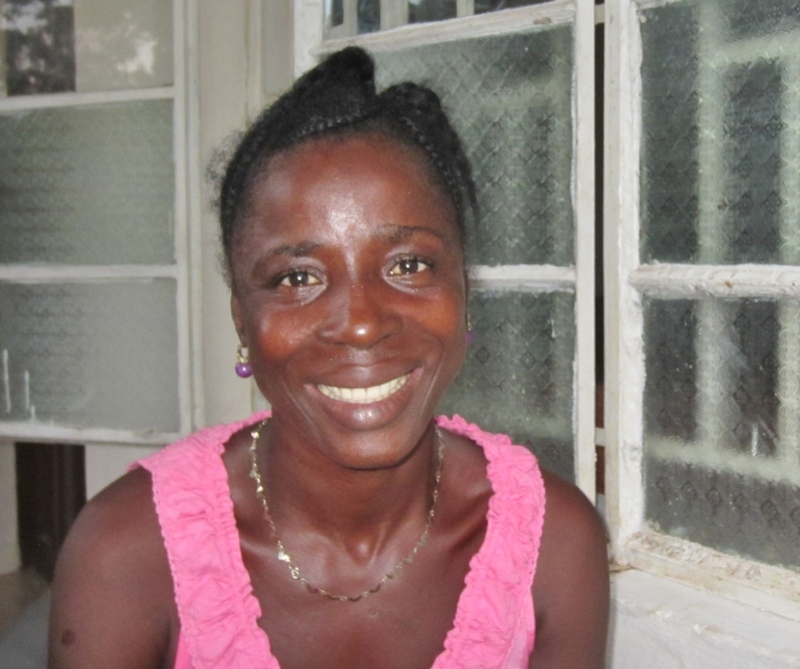 Secondary School Teacher – Emanuel Mbasy teaches at Walter Schutz Secondary School. Emanuel sees technology quickly changing and wants to be part of it. With computer literacy for himself, he can then also teach his children. He can create his own documents and quickly find them, like class lessons, exams and other documents. Files get missing at school, and he could better maintain them. 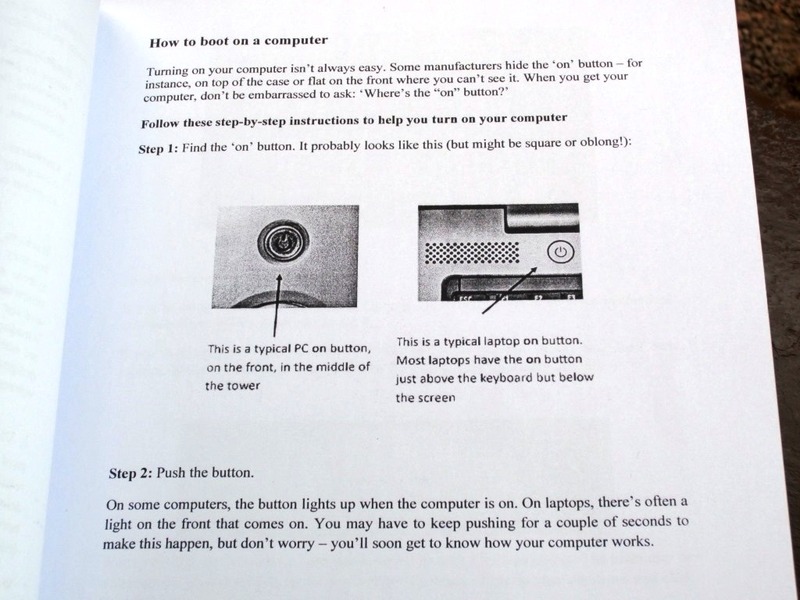 Practical instruction manual designed by CCET: how to boot a computer. The CCET teachers are good and he’s not finding it too hard to learn, if you concentrate and practice. Practice is unfortunately limited to a few hours of classroom time each week, and students like him do not have their own computer to practice on at home. They do have a good manual CCET prepared for them they can take home and review. Emanuel wants to give his special thanks to Schneider Electric and TIP Capital for allowing him to join the rest of the world with learning computers. May God bless them. More computers for their personal use would be great. Muslim Missionary and Imam – Osman Sesay is a young Imam with the Amaddiyah Islamic mission present in Rotifunk. Technology is improving, and the Amaddiyah mission has a computer, but he didn’t know how to use it. He’s glad for the chance for lessons now. He wants to be able to keep speeches on the computer, as well as lessons and exams for the Amaddiyah school. They conduct marriages and need to issue marriage certificates. 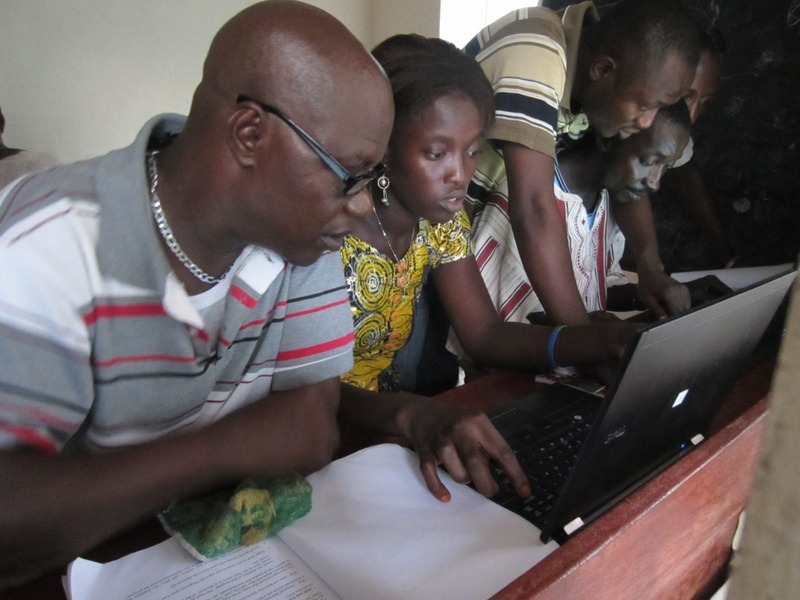 Imam Sesay really wants to learn to use a computer. It’s difficult, but he will learn. He’s not fortunate to have his own personal computer, and would really like to have one. Computer lesson: teachers give 1:1 help. 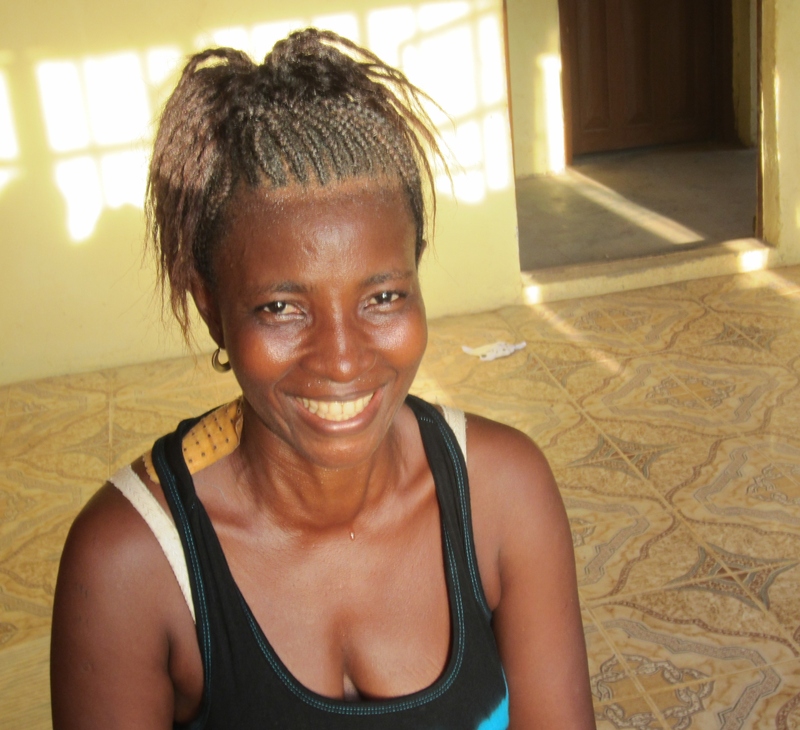 Construction Contractor – Abu Bakar Conteh is a contractor building new buildings at the Prosperity Girls High School. As a contractor, he needs to give bids and estimates and keep them. Offices with files are a luxury in rural Sierra Leone, and his work keeps him on the move anyway. A computer would help him organize his work and keep it available, as well as make calculations easier. A computer would also allow him to advertise his business through the internet. Abu Bakar enjoys computer lessons very much and is finding it easy, despite this being his first class. He’s learned to write and save some documents, and he’s become familiar with the keyboard. He would like to thank Schneider Electric and TIP Capital so much. 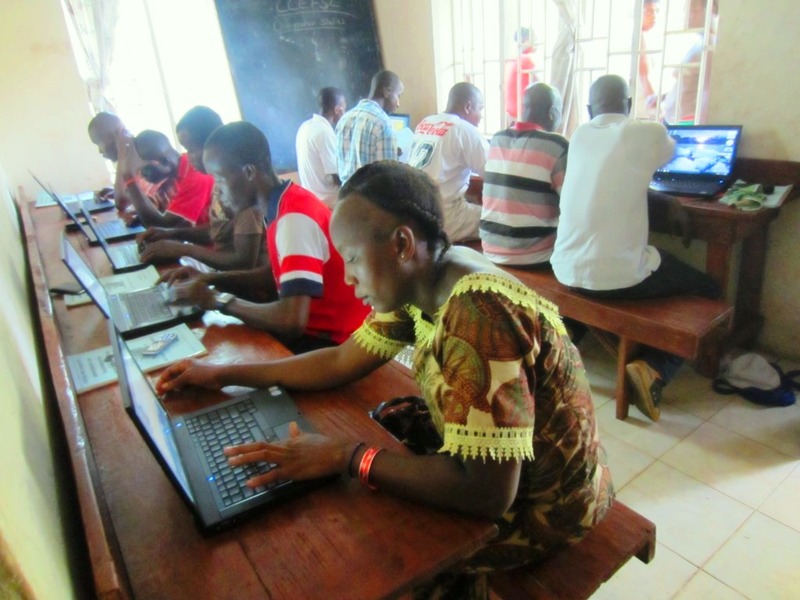 They find it difficult to get computer lessons in Sierra Leone, especially in a rural place, and these companies have made it so easy and inexpensive for him. DSTV Satellite Dish Operator – Sembu Fallah maintains DSTV service for the area. We are living in a computerized world where knowledge has advanced, he says, and he would like to know it better. He wants to be a perfect man and learn enough to teach others as an additional job. He could also use a computer to join the DSTV signal to a computer for viewing sports games here in Rotifunk as an additional source of income. Sembu wants to thank Schneider Electric and TIP Capital for what they’ve done for them. He really appreciates it, and prays they will bring more. If he had his own computer he would continue to practice at home and not be limited to three 90 minute classes a week at the CCET office.